Highly touted Yankees’ prospect Joba Chamberlain has been promoted twice already this season and today will be his third as he will be called up to the big show tonight according to the NY Daily News. He was in New York last week in order to fill out the paper work for a passport and last night he used it to fly to Toronto where he is scheduled to come on in relief of Roger Clemens tonight. "He's certainly catching everybody's attention quickly, hasn't he?" said Joe Torre to the Daily News. Chamberlain was drafted 41st overall during the 2006 draft as part of compensation the Yankees received when Tom Gordon signed on with the Phillies. He did not even play in the minors last year partly due to triceps tendinitis, but made a name for himself during the Hawaiian Winter League racking up a 2.63 ERA. This year he started out with the Yankees class-A affiliate Tampa where he posted a 4-0 record with a minuscule 2.03 ERA. After being promoted to double-A Trenton he continued his success while striking out 66 batters in just 40.1 innings. 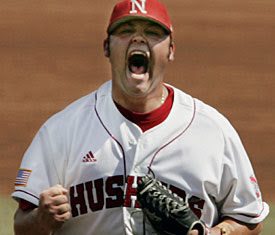 In early July Joba was picked to represent the Yanks at the 2007 Futures Game in San Francisco. Up to this point he had been only thought of as the future of the Bombers, but with a struggling bullpen it is at this point that the team’s front office begins to realize he can be a help now. In late July he was sent to triple-A as a final test to see if he was ready to help the Yankees as soon as this season. In three appearances, two in relief, he pitched 8 innings and struck out 18 and the team apparently feels he is ready. "To be happening this quick, it's just a dream," the Joba’s father said to the Omaha World-Herald. "It's a dream that was always there, but to achieve it this quick, it's unbelievable. It's surreal." Joba’s total minor league numbers for the year are 9-2 record, 2.45 ERA, 135 strikeouts, 27 walks, all over 88.1 innings.